Most of the systems have Kanban view to visualize sales and support performance and workflows. In VTiger open source, we cover this void. 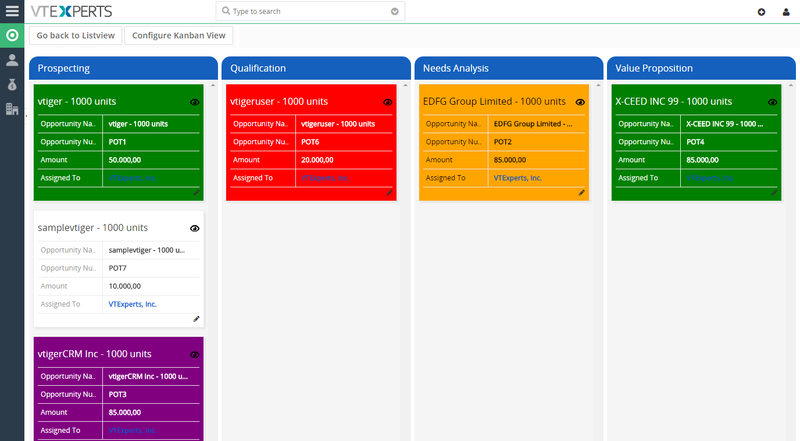 Kanban view is an extension for VTiger open source that allows to quickly create dynamic cards and exhibit the team’s performances as well as to collaborate with teams and manage sales, opportunities, tickets, projects, project tasks, or any other list of records. The extension also supports drag & drop feature to quickly move cards among columns that are configurable field values. This updates the field values/status/stages of the records (cards). We are hereby to announce a UI change, where we moved the Kanban view button from top and added it to the lists in every module. This looks like a slight change, but that actually saves Kanban resource from being triggered every time the listview is opened. 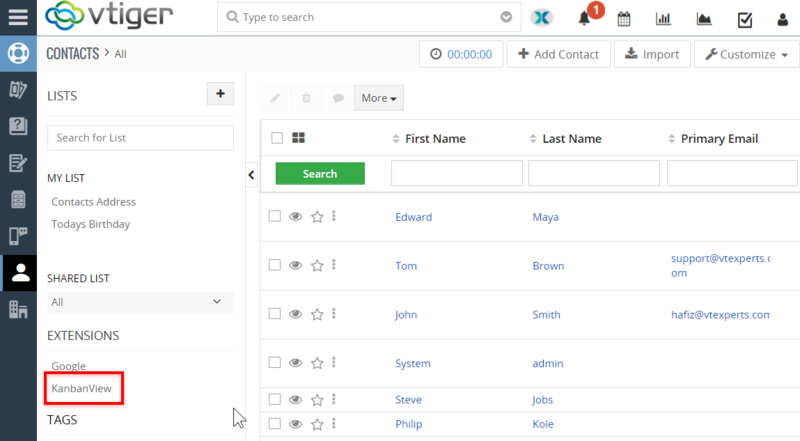 Instead, now the service is only called when a user clicks the Kanban list. This adds reasonable boost to the page loading and saves system and connection resources. This does not affect the way Kanban works, though. The extension is still the same strong and useful tool to keep an eye at the performance of team, visually. You can find more information on how to use the extension in the Extension Guide. The product information along with video, live demo, and helpful articles is available on the product page of Kanban View. The extension is included in the extension pack. If you still have more questions, please do not hesitate to contact us at [email protected] or join our team for live chat at www.vtexperts.com.